Keeping customers, employees, suppliers and vendors happy plays a large part in the success of your business because no matter what kind of business you are in, without the participation and enrollment of your team and the support of your clients, you will not be in business for very long. A gift is an easy way to let your “team” know how much you appreciate their dedication and hard work; and show clients how much you appreciate their business. It’s your way of saying “thank-you” in a tangible manner. Before giving any corporate gift, check and be absolutely sure that gift giving is allowed with the company of your client.Many companies have policies in this regard. *NB: This is the most crucial guideline that you must follow. Do not give personal gifts. Instead, consider giving generic gifts that anyone can enjoy, like food gift baskets, office/desk accessories, tickets to events, restaurant gift certificates, etc. Corporate gift giving should never be used to compensate clients or employees for less than expected wages or services. A corporate gift should be something that is given in addition to the wage or salary of an employee. Gift giving should make recipients feel good about their accomplishments. If your company chooses to give a corporate gift for the holidays, be sure to check the recipient's religious or cultural background as there is the possibility of offending your recipient and defeating the entire purpose for the gift. When possible, consider giving the gift in person. Be sure to check with the schedule of the recipient, first. 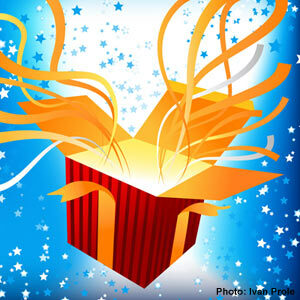 Corporate gift giving should be in line with your company's budget. Do not go overboard and buy gifts that you cannot afford nor should you try and save money by purchasing gifts that are "cheap." Employees and clients DO talk amongst themselves so to avoid conflict, give gifts that cost about the same price across the board.